(Nanowerk News) Swiss researcher Alexandra Teleki has won the first prize in the DSM Science & Technology Awards (South) 2009. An international judging committee, chaired by Dr Manfred Eggersdorfer, R&D Director at DSM Nutritional Products, selected Alexandra Teleki, who obtained her doctorate from the Swiss Federal Institute of Technology ETH Zurich (Switzerland), for her PhD research on the production and application of coated nanoparticles. Alexandra Teleki has succeeded in developing a highly reproducible method for the simplified production of structured nanoparticles. Structured nanoparticles are expected to play a major role in enabling sustainable routes to materials production. Dr Teleki was presented with the award by Mr Leendert Staal, President and CEO of DSM Nutritional Products on Tuesday, June 23, at a festive awards event at Park Hotel Vitznau in Vitznau (Switzerland). As the winner of the first prize she will also receive a cash prize of EUR 10,000. The second prize (EUR 5,000) was awarded to Christian Nilewski of the Swiss Federal Institute of Technology ETH Zurich (Switzerland) for his PhD research on marine toxins and their effect on human health. The third prize (EUR 2,500) was awarded to Frederik Wurm of the Johannes Gutenberg University Mainz (Germany) for his PhD work on linear hyperbranched block copolymers that offer great potential for medical and pharmaceutical applications. The other nine finalists will each receive a cash prize of EUR 1,250. The DSM Science & Technology Awards form part of the DSM Innovation Awards Program sponsored by the DSM Innovation Center. They are granted for outstanding PhD research by doctoral students from Switzerland, which is the home base of DSM Nutritional Products, and the neighboring regions of Austria, Northeastern France and Southern Germany. In its report about the winner of the first prize, the judging committee said it was impressed by the considerable scope of the research of Alexandra Teleki, ranging from the development of new production methods to the application of a series of new coated nanoparticles: ‘A striking aspect of the research is that all of the synthesis and preparation steps have been simplified, particle formation and coating now being integrated in a single flame synthesis step.’ The judging committee expects that the outcome of the research will prove very useful in the routine and large scale synthesis of silicon oxide coated and metal dotted nanoparticles. The judging committee commended the high quality of the work of all the other finalists. Alexandra Teleki conducted her research at the Institute of Process Technology, Swiss Federal Institute of Technology ETH Zurich (Switzerland), under the supervision of: Prof. Sotiris E. Pratsinis. Christian Nilewski conducted his research at the Laboratory of Organic Chemistry, Swiss Federal Institute of Technology ETH Zurich (Switzerland), under the supervision of Prof. Erick M. Carreira. Frederik Wurm conducted his research at the Institute of Organic Chemistry, Johannes Gutenberg University Mainz (Germany), under the supervision of Prof. Holger Frey. DSM launched the Science & Technology Awards twenty-four years ago. 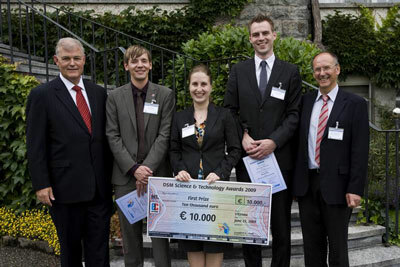 Until 2006, the awards were open to doctoral students from the Netherlands, Belgium and the German state of Nordrhein-Westfalen (DSM Science & Technology Awards – North). In view of the high reputation and popularity the awards had gained in academic circles, in 2007 DSM introduced a parallel contest for PhD researchers from universities in Switzerland, Austria, Northeastern France and Southern Germany (DSM Science & Technology Awards – South). DSM performs a great deal of its R&D work in close collaboration with universities. Through its Science & Technology Awards DSM wants to encourage young research scientists to undertake creative, pioneering research. This is important because this kind of research often provides the basis for the development of new, knowledge-intensive industrial processes and innovative products.